Cam Ward #30 of the Chicago Blackhawks stretches during a break between the Blackhawks and the Nashville Predators at the United Center on December 18, 2018 in Chicago, Illinois. 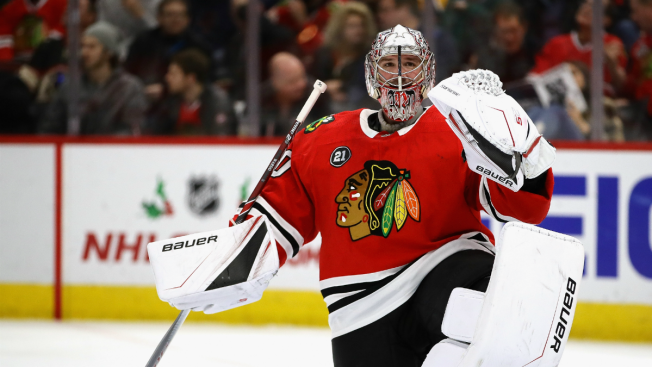 Chicago Blackhawks goaltender Corey Crawford is easing his way back into the mix after returning from a concussion earlier this season, but now he’ll really be thrown into the fire as Cam Ward is expected to miss at least seven days. Ward, who has been serving as Crawford’s backup since the netminder was activated from injured reserve in late February, will miss seven to 10 days as he battles a knee injury. The team says that Ward will not participate in any hockey-related activities during that time, so his absence could last even longer. In a corresponding roster move, the Blackhawks have recalled goaltender Collin Delia to serve as Crawford’s backup. Delia has appeared in 15 games for the Blackhawks this season, posting a 3.48 goals against average and a 6-4-3 record in those games. The Blackhawks will next take the ice on Thursday night as they welcome the Buffalo Sabres to the United Center. Puck drop is scheduled for 7:30 p.m.